We continue with our preview lists of the top returning athletes per division in each event with lists of the returning sprint fields this time for D4 Girls. For starters, Nevaeh Grant (Pima, Fr.) finished 3rd in the D4 Girls 100m and 6th in the D4 Girls 200m finals as a freshman at the AIA Track and Field State Championships last year. Ranked behind Grant, is Lauren Casey (Tempe Preparatory, So.) with a PR of 12.88 for the 100m dash. She would finish 4th in the D4 Girls 100m and 5th in the 200m dash. To round out the mixed bag of potential favorites in the D4 girls' sprints, we go to Eleni Pappas (Northland Preparatory Academy, Sr.) who finished 7th in the D4 Girls 100m final and 3rd in the 200m final. Pappas is ranked no. 1 among D4 Girls in the 200m for her lifetime best of 26.44 seconds from the Mingus invitational back in April. For the 400-meter dash, also known as the long sprint, the top three finishers in the D4 Girls race at State will return. 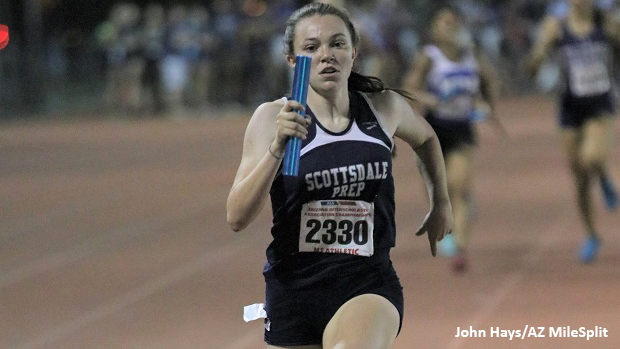 Beginning with the returning D4 Girls State Champion, Mckenna Lane (Scottsdale Prep Academy, Jr.) ran a PR of 58.31 to clinch the D4 Girls 400m Title, the day after winning the D4 Girls 800m Title. Behind Lane, Georgia Vallery (Anthem Preparatory) was the D4 State Runner-Up in the 400m and the only other sub-60 400m girl out of Division 4. At the AZ Meet of Champions, she dipped just below the 60-seconds for a new lifetime best of 59.98 seconds. Angel Addleman (Pusch Ridge Christian, Jr.) also returns after finishing 3rd in the D4 Girls 400m Final at State. Check out the Top 100 Returning D4 Girls in the individual sprints.